Today marks the start of your South America adventure. 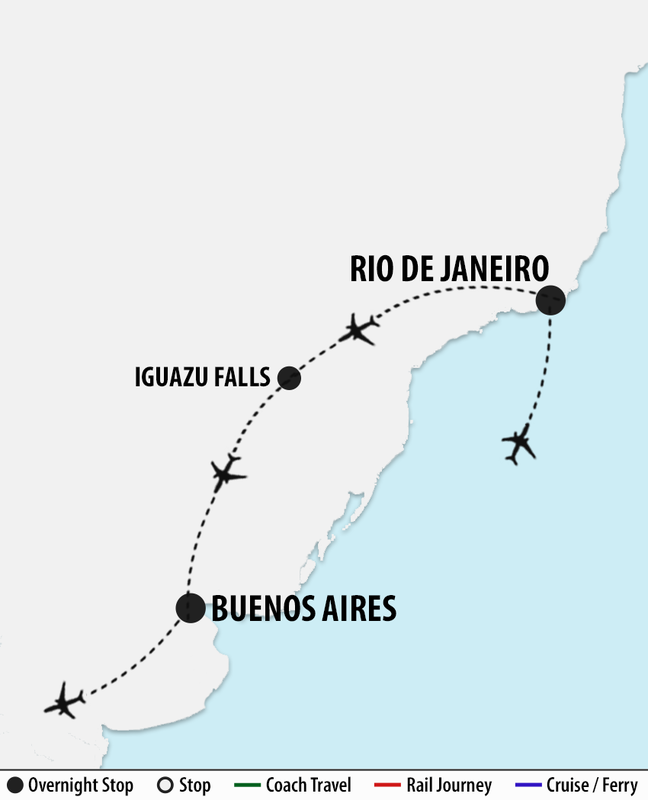 Cross the Pacific Ocean on your journey to Rio de Janeiro, Brazil where you will be met and transferred to your hotel. Enjoy a full day at leisure in the city of Rio de Janeiro. Spend the day relaxing on one of Rio’s famous beaches or discover some of the city’s iconic attractions. This afternoon, meet your Tour Director and fellow travellers at your hotel for more details about the upcoming days’ adventures. Begin the day with a visit to the Cosme Velho district where you will board a cogwheel train. Wind your way through the Tijuca Forest to the top of Corcovado Mountain. Have a closer look at the tropical forest’s lush vegetation and enjoy panoramic views of the city. Disembark at the top of Corcovado Mountain where you will stand next to one of the Seven Modern World Wonders: the Statue of Christ the Redeemer. From here, you have unparalleled views of the “Marvellous City”. 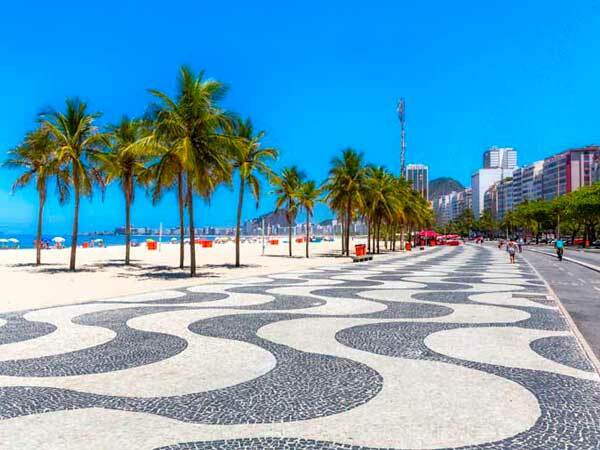 Later, drive along some of the most famous beaches in the world-Copacabana and Ipanema. The rest of the day is yours to explore the city at leisure. Today, enjoy and explore. Perhaps board a helicopter and soar high over Rio or visit one of Rio’s hillside favelas, interacting with locals and gaining a new understanding of Brazilian society. Maybe discover the charm and beauty of Santa Teresa, which originated around a convent during the 16th Century and is home to artists, galleries, museums and eateries, or relax on the beach. This evening, join your fellow travelling companions at a local churrascaria where meat is cooked in the churrasco style. Fly from Rio de Janeiro to Iguassu Falls. Located where the Iguassu River empties its waters into the Parana River, the falls form the world’s widest waterfalls and gives rise to the double border of Brazil and Argentina. Settle into your hotel this evening where dinner is served. This morning, enter the Iguassu National Park on the Brazilian side of the falls. Walk along the paths to the catwalk that leads to the bottom of Devil’s Throat, enjoying magnificent views. The morning is spent at the falls with the afternoon at leisure. Consider several optional experiences for your leisure time: embark on the Macuco Safari for a exhilarating ride to the base of the falls or you may choose to visit Bird Park, home to more than 900 native birds while walking through subtropical forests. For the more adventurous, you may wish to take an optional helicopter flight (extra cost) for spectacular aerial views of the falls, National Park and the surrounding jungle. Depart from your hotel with a quick customs stop. Cross the Tancredo Neves Bridge, the border between Argentina and Brazil. Once in Argentina, take a scenic drive up to the Argentinian Iguassu National Park. Visit the Argentinean falls and visitor’s center, then proceed to the river cascades and falls aboard the Ecological Jungle Train to the most impressive observation point, Devil’s Throat. This afternoon, fly to Buenos Aires. Today, see the famous 9 de Julio Avenue, the widest avenue in the world and pass by the beautiful Colon Theater, the cultural pride of Buenos Aires. Arrive at the main square, Plaza de Mayo, which is surrounded by the Government House and the first City Hall. Stop at the Metropolitan Cathedral before continuing on through San Telmo, a historical neighbourhood and the oldest district of Buenos Aires. Visit La Boca, a very colourful area of painted houses. Continue to Recoleta Cemetery, home to the grave of Eva Duarte, “Evita.”. This evening, enjoy dinner and a Tango show in historic Buenos Aires where the golden age of Tango shines once again. Experience the great Argentinean passion with a live orchestra and classic Tango dancers. Set out into the city on your own or join several optional excursions available to you. Perhaps learn about the life of the Gauchos. Appreciate the charm of the Argentinean landscape as you travel out of the city to the region known as the Pampas. Round out your day in the countryside with a barbecue lunch, Argentinean wines, folk music, traditional dances and Gaucho games. Or consider an optional trip to Tigre and Delta Rio de la Plata, the aristocratic northern district of San Isidro Arrive in Tigre, a charming seaside town. Enjoy a boat excursion around some of the stunning islands of this delta. Your Travel Director will be more than happy to help you plan your day. Hasta que nos encontremos de nuevo-until we meet again. Check-out of your hotel this morning and leave your bags with reception, before enjoying a full day at leisure in Buenos Aires. A transfer will take you from your hotel to Buenos Aires Airport tonight in time for your flight home. Today is spent crossing the International Date Line on your journey back to Australia. Arrive back in Australia on your flight from the USA this morning. Flights are included from all departure cities shown as required. These are based on Air New Zealand ‘V’ Class Economy airfares, and are subject to availability at the time of your booking confirmation. Within 15 days of departure – 100% of total booking value.